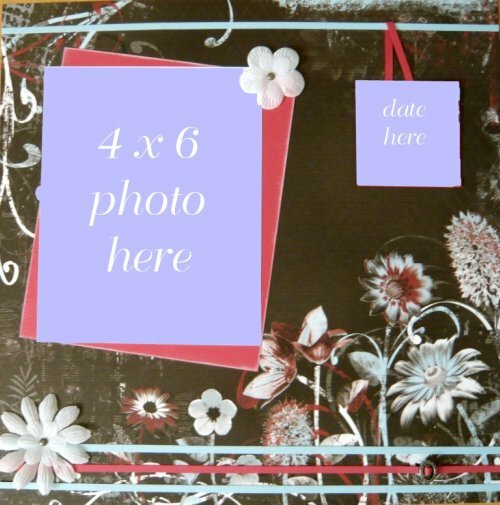 Cut a photo mat, slightly bigger than your photo from the red cardstock. Mount the mat at an angle onto the flowery side of the patterned paper from the kit. Adhere your photo level onto the red photo mat. Thread the metal charm onto the red strip and place it ¾ of the way along it. Cut a few more thin strips from both shades of cardstock. Take the tag from the kit and cover the edges with the strips of card. Take one small strip of red cardstock and attach it to either side of the tag, so that it hangs, using a small amount of glue. Thread this hanging tag onto the remaining blue strip and then adhere the whole thing to the top third of the layout, above the photo. Add your journalling to the tag. Playschool Scrapbook Layout Kits courtesy of Storytellersclub.com.